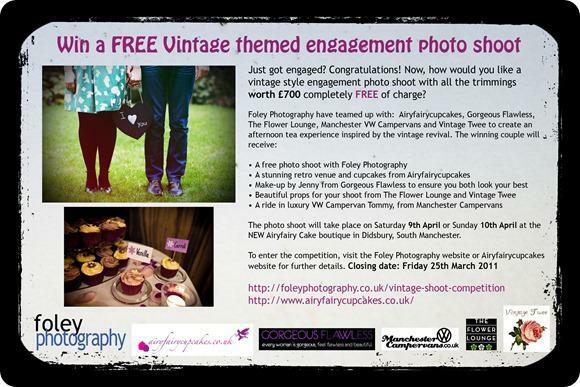 Foley Photography and Airy Fairy Cupcakes, located in the North West, have been in touch to let Brides Up North know about a fabulous vintage themed engagement photo shoot competition, which is a collaboration between a fantastic group of North West suppliers. You know I love to champion Northern suppliers, and I am told that this lot are the best of the bunch! This is a fantastic prize for any Northern Bride to Be. Visit the Foley Photography website or the Airy Fairy Cupcakes website by Friday 25 March 2011 to enter. You could see the results blogged here on Brides Up North! Just wow! Visit Foley Photography or Airy Fairy Cupcakes now and be in with a chance of celebrating your engagement with some beautiful images that you can keep forever.